The first time I heard the term “purple prose” I was puzzled. Exactly what mistake was I being warned against. For years afterward I felt I knew purple prose when I saw it but the injunction remained frustratingly vague. In other words, writing about the weather is fine as long as it’s either fascinating in and of itself or if it is relevant to something in the story. One way of making weather relevant is to write about a character's reaction to it. For example, is the weather preventing the character from accomplishing her goal? Here’s an exception to the rule: One of my favorite books growing up was A Wrinkle in Time by Madeleine L’Engle. How do you think that book begins? That’s right! “It was a dark and stormy night.” I kid you not! Which brings us to the nub of the issue: What makes purple prose undesirable? An important clue comes from the history of the term. 1. Purple prose doesn’t belong. It’s markedly more floral than the prose around it. So, to a certain extent, whether a particular passage is purple depends on the writer's overall style. His or her voice. 2. Purple prose is intended to distract the reader from the fact that nothing is happening in the story. The plot isn’t moving forward, it’s stagnant. The characters aren’t pursuing their goals. As a result the story is dull and dry. The extravagance of the writing itself is the only thing driving the story forward. So, of course, it fails. As I mentioned, above, purple prose needn’t be awful. That is, purple prose needn’t itself be poorly written. In fact, it can be beautiful. The thing that makes prose purple undesirable is that it distracts the reader. Why? Because it’s unnecessary. 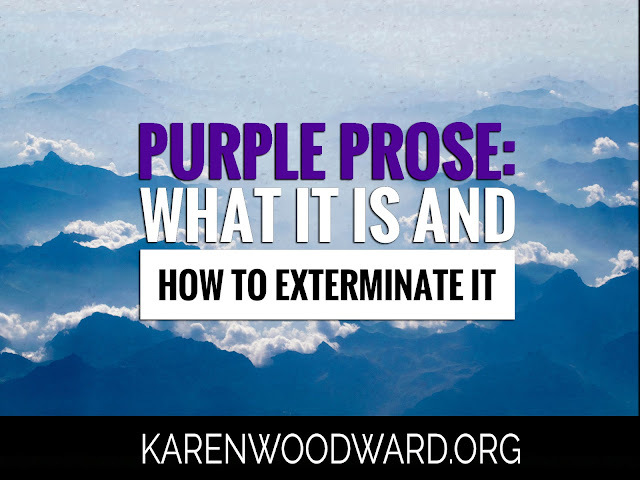 As we've seen, purple prose breaks the reader out of the story because it calls attention to itself. Purple prose is like a fairy tale king, dressed sumptuously giving a long flowery speech to plainly dressed commoners, a speech that holds nothing relevant to them, to their lives. His subjects would rather he just stopped speaking so they could get on with their day. The advice to “kill your darlings” is, at least in part, an admonition against purple prose. Purple prose is, above and beyond anything else, unnecessary. If you removed a purple passage the story itself would not change. That’s the test. The action of every character needs to have a goal, a purpose. It should either forward the plot or advance a character’s goal (and, really, these two are the same thing). Instead of writing “Grignr’s emerald green orbs glared lustfully” write “Grignr glared.” The two statements express more-or-less the same thought. Eliminate adverbs whenever possible. Instead of writing, “He crossed the street quickly,” go with “He ran across the street.” They say the same thing and the second one is clearer. Writing Excuses: Beautiful Prose, Purple Prose. As I mentioned in a previous article (6 Inspirational and Informative Writing Podcasts), I’m a big fan of podcasts, especially writing podcasts, and Writing Excuses is one of my favorites. Recently they published an episode (see link, above) all about purple prose. Highly recommended! Today I’m recommending an anthology put out by the hosts of Writing Excuses: Shadows Beneath: The Writing Excuses Anthology. That's it! I'll talk to you again on Friday. Until then, good writing! 1. “It was a dark and stormy night” from wikipedia.org. 2. Writers On Writing; Easy on the Adverbs, Exclamation Points and Especially Hooptedoodle, by Elmore Leonard. 3. Eye of Argon, by Jim Thesis. 4. “Paul Clifford,” by Edward Bulwer-Lytton. Thanks! I needed this Karen!